Supporting Cat Health with Information and Health Studies. When your favorite feline friend is aging, give some extra TLC. Is Your Cat Slowing Down? Is It Time to Say Good-Bye? Not long ago, cats were considered seniors at eight years old. Today, it's not unusual for veterinarians to have feline patients in their twenties. Thanks to improved nutrition, living indoors, and advances in veterinary medicine, cats live longer and are now considered older at 12 to 14 years, says Richard Goldstein, DVM, assistant professor in small animal medicine at Cornell University College of Veterinary Medicine, whose oldest feline patient reached a healthy 22 years old. "Growing older is not a disease," he emphasizes. "While it's true that senior cats are more likely to get different conditions, some older cats are perfectly normal and don't change at all." Older cats tend to be less active and playful, they may sleep more, gain or lose weight, and have trouble reaching their favorite places. Don't chalk up health or behavior changes - often gradual - to old age, however. Such changes can be signs of common diseases or dental problems that should be addressed by your veterinarian. Making sure older cats have easy access to the things they enjoy and/or need is critical, says Emily Levine, DVM, animal behavior resident of the Animal Behavior Clinic at Cornell University College of Veterinary Medicine. "We remember to give them medications, but we tend to forget about addressing food, water and litter box issues," she says. Indeed, many cat owners don't realize the practical things they can do for their aging cats. To help your older cat enjoy her golden years, consider these simple suggestions. See the vet. Schedule regular veterinary exams to enhance your older cat's well-being. "Six-month checkups for geriatric cats are great," Dr. Goldstein notes. "For healthy cats, a yearly geriatric exam - including blood work and X-rays - along with a smaller exam in between, is ideal," he recommends. Think warm. Cats like to seek out warm places to rest. 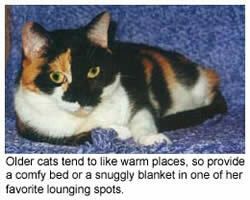 Make sure your older cat's favorite soft bed or resting place is not in a drafty area of your home. Too much heat, though, can potentially burn a cat who can't move quickly, so be sure to think warm, not hot. Provide easy access to basic needs. As cats age they are more prone to getting arthritis and may have reduced control over their bowels and bladder, Dr. Levine says. It's a good idea to install litter boxes on every floor to make them easy to reach. In addition, some older cats may climb into a normal litter box to urinate but not to defecate. To help solve this problem, use a litter box with very low sides (try a large cookie sheet) or place newspaper around the litter box, she advises. "Older cats should have easy access to food, water, and litter boxes, so if they choose not to climb stairs they don't have to," she adds. This may mean placing food and water bowls in more than one place as well. Help him get there. If your older cat can no longer jump on his favorite windowsill, create box steps, ramps, or purchase pet stairs that allow him to safely reach a special spot on his own. This also works for a cat that wants to reach a favorite chair or sofa. The idea is to provide firm footing; for example, cover steps or a ramp with carpet to prevent slipping. Gently groom. Older cats can benefit from more frequent hands-on help if their self-grooming begins to wane. (Be aware that a sudden lack of grooming may signal a health problem.) This is particularly crucial for longhaired cats who become uncomfortably matted. Gently brushing or combing removes loose hairs and stimulates circulation and sebaceous gland secretions, returning luster to the coat. Turn on a light. Nightlights help older cats with poor vision or eyesight problems navigate at night. If your cat is blind, try to keep your cat's environment as stationary and consistent as possible, including litter boxes and furniture, Dr. Levine recommends. To avoid disorienting or startling a blind cat, do not pick him up unless necessary and call his name before approaching him. Give a deaf cat a point of view. You should approach a cat with hearing problems from the front rather than behind to avoid startling or scaring him. Keep him safely inside your home to protect him from cars and predators. Keep her kitten-free and playful. "I do not recommend getting a young kitten to rejuvenate your older cat - a rambunctious kitten climbing all over your cat may be more detrimental than helpful, and people have a tendency to focus on the young cat and ignore the older one," Dr. Levine says. Instead, find gentle ways to encourage your older cat to play with you, she suggests. Try waving a wand, going for a walk with your cat inside your home, and playing chase the kibble, one piece at a time. Don't forget the basics. Fresh water and good food are vital to cats of any age, but may be particularly important for older cats. Your veterinarian can offer advice on choosing a diet that provides appropriate nutrition and the right amount of calories for your aging cat. "It's especially important that senior cats have easy access to clean water because kidney function frequently deteriorates in older cats," Dr. Goldstein says. "Consider mixing canned and dry food to let your cat absorb the water canned food offers," he suggests. Finally, older cats cherish predictable days more than younger cats do. "Just as we become set in our ways as we get older, cats do too," Dr. Goldstein says. "Some cats may need more emotional support as they age and others may prefer to be left alone," he explains. "They may become more dependent on relationships and require more attention. It may be harder for them to deal with changes." Sticking to normal routines reassures them, he adds. 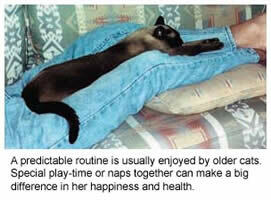 "Older cats enjoy spending time with their human family members, Dr. Levine concludes. "It is important to give them the extra tender loving care that they'll need for many years to come." What are signs of aging?